I bought a bunch of these pumpkins from the dollar tree a couple years back. Then I decided they looked, well, like they came from the Dollar Tree. lol So, I never did anything with them. 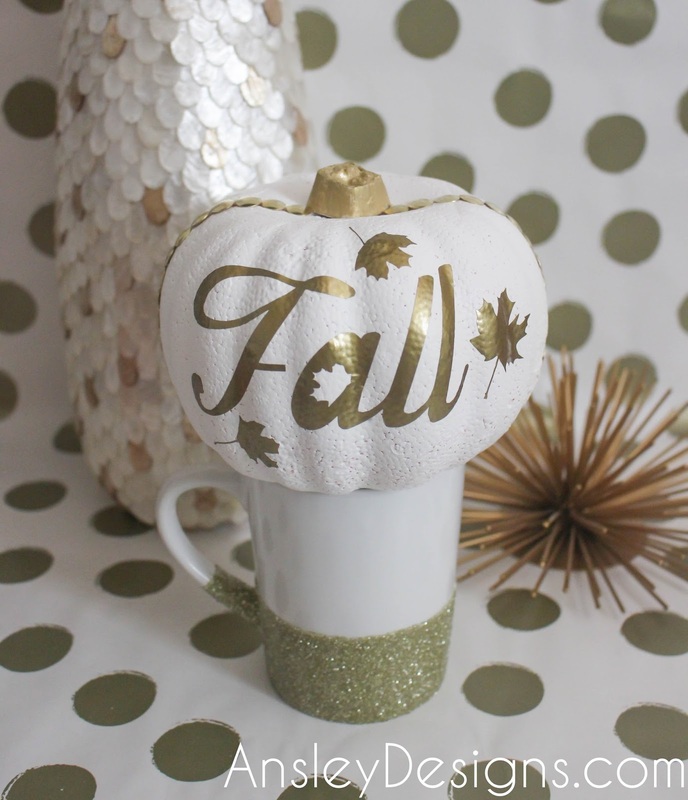 That is until I was shopping in JoAnn's one day and saw some gorgeous, glittery pumpkins, which I refused to pay for! Then I remembered..the crappy dollar store ones. 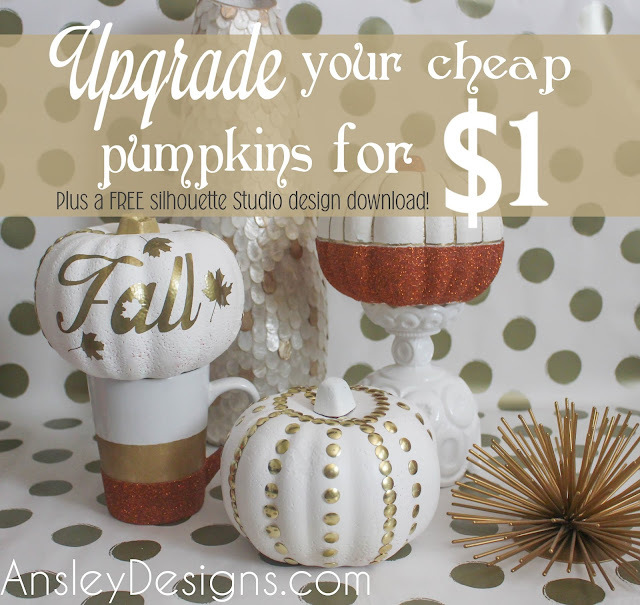 So, I decided to upgrade my pumpkins! 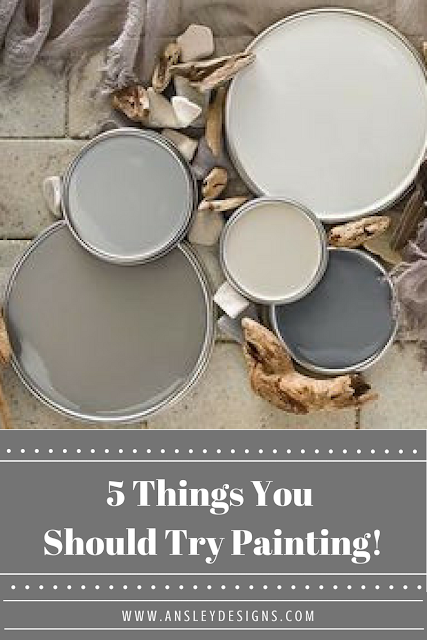 If you typically do crafting and DIY you'll likely have most of the items needed on hand. I gave each pumpkin a quick wipe down and sprayed it with primer. Once that dried I followed with the white paint. It looked better already! 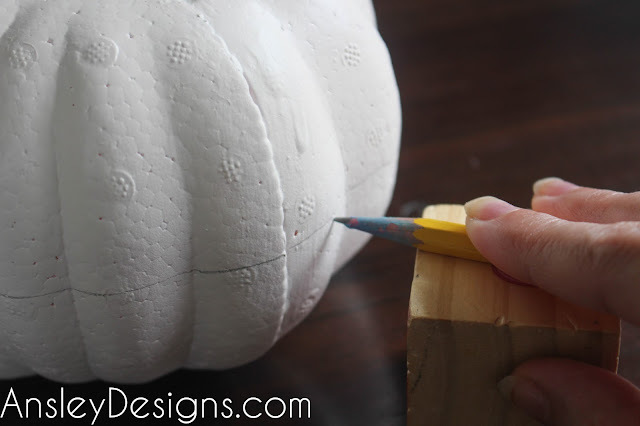 To get my line straight all the way around, I used a pencil resting on a baby block while I turned the pumpkin to draw the line. 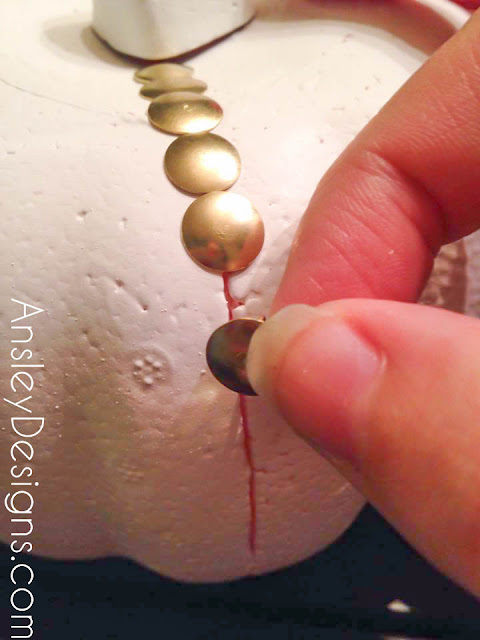 You can use anything that's an even surface and the desired height. Now the BEST part! 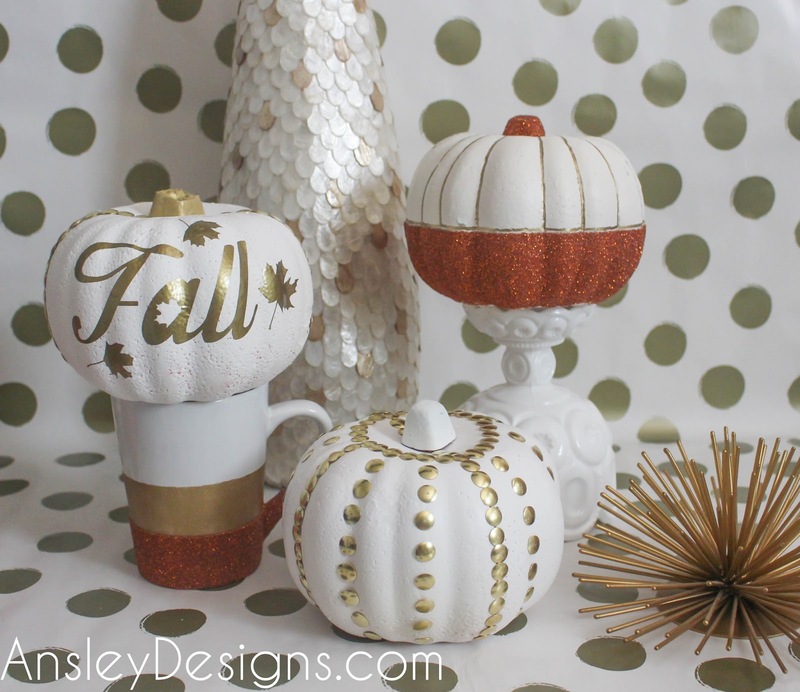 Simply tape around the pumpkin and apply a thin layer of mod podge . Cover that puppy with your glitter! Let it dry 1-2 hours. Apply another coat of mod podge and glitter if needed. 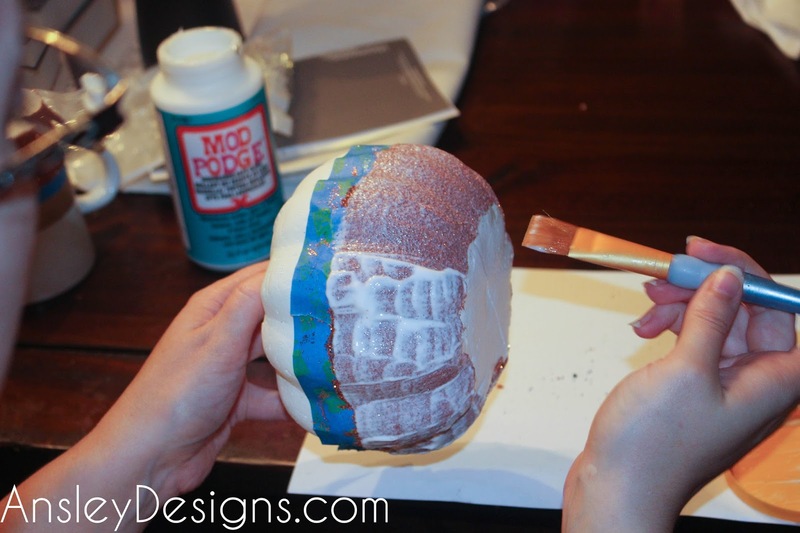 Apply 1-2 coats of mod podge over the glitter to seal, allowing for dry time in between. I always glop the mod podge on really thick, so it doesn't dry on me during the application. Then once it's all covered, I go back and quickly smooth everything. Once all your coats are completely dry, slowly remove the painters tape! I decided to do one more step and paint the lines of the pumpkin with a gold paint marker. Mostly because you could still see my pencil line above the glitter! haha! 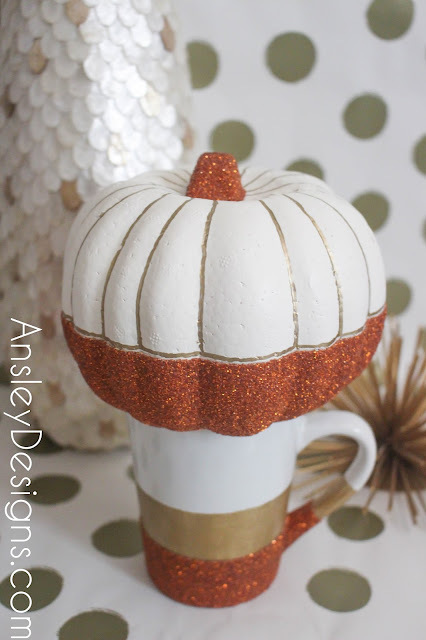 I had all of the materials on hand, so this only cost me a buck for the pumpkin itself! If you're interested in the candy corn glitter mug, you can order one here! I picked up some pretty GOLD push pins at the Dollar Tree. 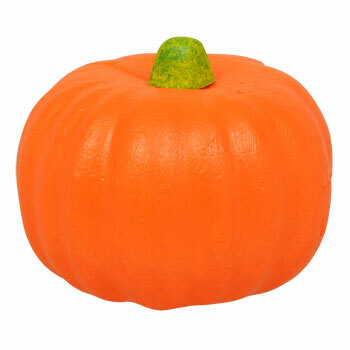 This pumpkin cost me $2 (1 for the pumpkin and 1 for the studs!). The box comes with 300 push pins and that was MORE than enough for this project! These pumpkins have ugly lines going down the sides where the 2 halves are connected. So, I started by filling the lines with a full row of studs. I started to just go along the indentions of the pumpkin, but they aren't symmetrical...so I just chose the placement of the additional stud lines myself. 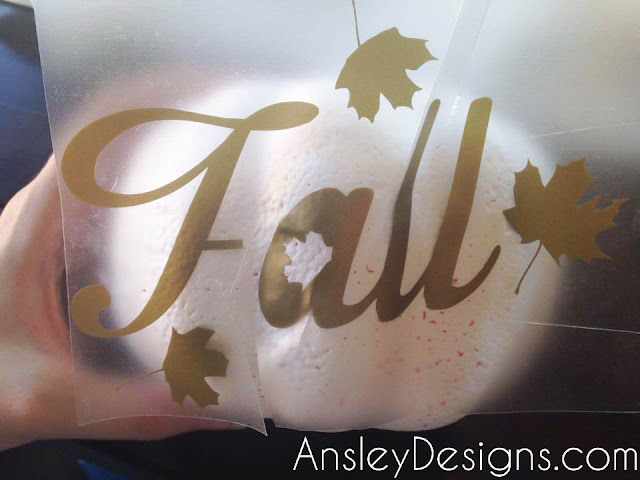 I designed the "Fall" with some leaves in my silhouette studio software. 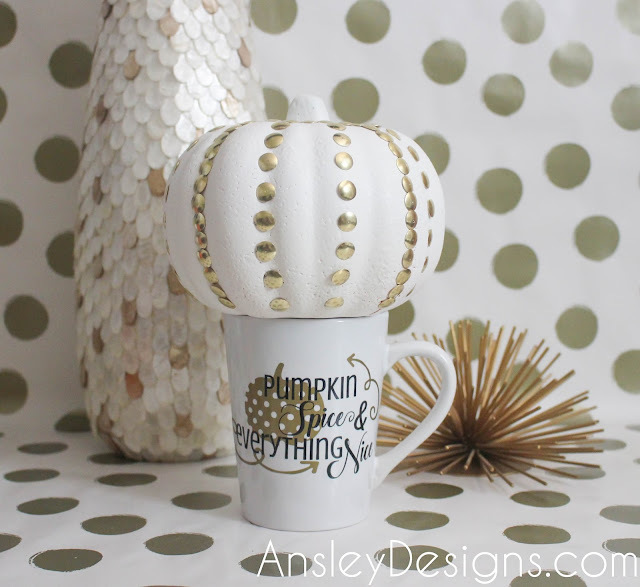 Then I just cut it out on some gold vinyl and applied it to the pumpkin. You have to be careful because of how curved it is...AND the vinyl itself will take the paint off. There's not really any leeway to re-position. I had to make lots of cuts in the transfer tape so that I was able to smooth the vinyl on without any issues. Then I painted the stem with some gold paint I had on hand. This one is so cute and simple! You can achieve the same thing by printing your design and using a xacto knife to cut it out if you don't have a silhouette machine. If you'd like to download the free silhouette template for this pumpkin, click here! 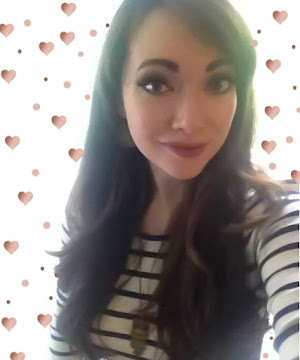 Here's the template as a simple image in case you'd like to print it out and cut it the old fashioned way. Just right click the image and save it to your computer. I love that you can customize these ANY way you like! I LOVE the Dollar Tree! I get so many things there for the holidays! These are all so adorable! I'll be sure to try the glitter design this season.